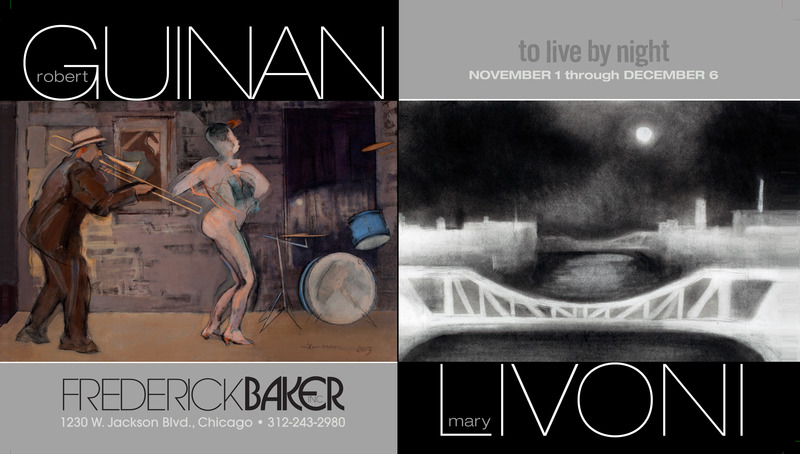 Frederick Baker Inc. is pleased to present “to live by night”, an exhibition of paintings by Robert Guinan and drawings by Mary Livoni. The gallery is located at 1230 West Jackson, Chicago, Illinois, in the west loop. An opening reception will be held on November 1st from 5- 8 pm, and the exhibition will be on view through December 6th. The gallery is open Mondaythrough Friday from 10:00 AM to 5:00 PM. This exhibition brings together two artists with distinctive interpretations of night in the city; Robert Guinan’s humanistic portraits and Mary Livoni’s gothic urban landscapes. Robert Guinan has received wide international acclaim throughout Europe for several decades; exhibiting with the Albert Loeb Gallery in Paris since 1973. In Chicago, the city from which he has drawn all of his inspiration, the opportunities to view his paintings have been extremely rare. In 2010, he exhibited with the Ann Nathan Gallery, his first Chicago show in more than 30 years. We thank the gallery for their cooperation in making this exhibition possible. Visit www.bigredhair.com/robertguinan to see more of his paintings and drawings. Mary Livoni’s charcoal drawings are inspired by the industrial neighborhoods along the Chicago River. Her work is included in private and corporate collections across the United States. My vision of Chicago,” states Livoni, “begins at twilight, ends at dawn, and is mostly uninhabited. My drawings have left the very real streets that inspired them and now describe a secondary world where visions occur. These are dreams; and describe not just Chicago, but the strange corners that exist in every Gotham all across the world.” Visit www.marylivoni.com to view more drawings and collages by this artist. Frederick Baker, Inc. is the Midwest’s largest gallery devoted to Works on Paper, American and European Fine Prints, Drawings and Watercolors. In addition to being in business for over thirty-five years, we are members of the International Fine Print Dealers Association. This entry was posted in Openings and Events and tagged art, Arts, Chicago, Frederick Baker, Mary Livoni, painting, Robert Guinan. Bookmark the permalink.